A man who took part in an assault which left a man with serious facial injuries has been jailed for more than a year and will be deported on his release from prison. Ioan Acozmei, 28, of Parkside, Little Paxton, was going to attack a woman on Market Square, St Neots, on the evening of March 27 last year, when the 29-year-old victim got in the way to protect her. Acozmei hit him in the torso with such force that he fell to the ground winded. Huntingdon Crown Court heard another man, who was with Acozmei, then kicked the victim hard in the head, leaving him unconscious and with serious injuries. Acozmei and his accomplice made off in a red Fiat Punto car while the victim was taken to hospital by ambulance. CCTV showed the car travel away from Market Square towards traffic lights on South Street where it was driven through a red light. Acozmei was driving with no insurance and no driving licence. Police traced the car and arrested him the next day. In September, he was found guilty of causing actual bodily harm, driving a motor vehicle otherwise than in accordance with a licence, using a motor vehicle on a road without third party insurance and failing to comply with a red traffic light following a three-day trial at Peterborough Crown Court. Acozmei, a Romanian national, had not attended the trial after leaving the country while on bail and was convicted in his absence. 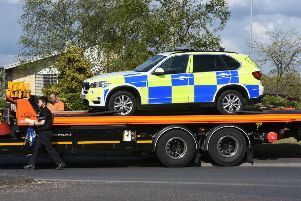 However, he was arrested by Bedfordshire Police at Luton Airport after returning to the UK and appeared at Huntingdon Crown Court on Tuesday (March 1) for sentence. He was jailed for a year for the offences, given an extra two weeks in prison for the breach of bail and a mandatory deportation on his release. DC Tom Nuttall, who investigated, said: “This was a cowardly offence, firstly his attempt to assault the woman and then quickly fleeing after the scene with his accomplice. A second man, Iosif-Gabriel Ciobanu, 20, pleaded guilty to causing actual bodily harm on the victim in the same incident but failed to appear at the end of Acozmei’s trial for sentence. Police now want to trace him. Call 101 if you see him.